Extraordinary, but only on paper. Great design; Nifty camera features; Wide viewing angles. Expensive; Mediocre performance; Terrible battery life; Uncomfortable for one-handed use. Android enthusiasts have been eagerly anticipating quad-core devices, and HTC has become the first one to offer such handsets in the country. With the One X, NVIDIA's Tegra 3 has also finally hit the Indian smartphone market. Apart from the raw power, the smartphone also boasts of a 4.7" S-LCD, and features Android 4.0 out of the box. 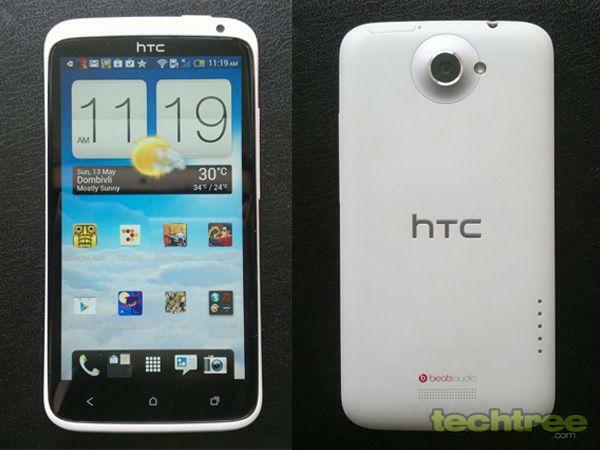 The video review for HTC One X. The retail box comes with the phone, charger with detachable USB cable, and a pair of earphones. As seen in the iPhone, the microSIM slot can be opened using a pin or a needle. Sadly, the phone doesn't have a memory card slot or an HDMI port. Measuring 5.3" (l) x 2.8" (w) x 0.4" (9 mm) (d), the phone is too big for one handed use. Thanks to its polycarbonate body though, it is relatively lighter at 130 grammes. The One X is one of the slimmest handsets from HTC's lineup. Additionally, its polycarbonate unibody makes it look premium. Having said that, the accents around the lens look terrible. Since the gadget uses similar material as that of the Lumia 800, it's good at hiding scratches. Overall, HTC has managed to build a slim and sturdy smartphone. The gadget's 4.7" Super IPS LCD2 panel has pixel dimensions of 1280x720, with the pixel density being as high as 312 ppi. The screen is bright, and impressively sharp. Additionally, it offers wide viewing angles and great contrast ratio. However, the panel's sunlight legibility is not very good, and the blacks aren't deep either. The handset is powered by a quad-core 1.5 GHz CPU, coupled with an ULP GeForce GPU. Other specs include an 8 MP primary and a 1.3 MP front camera, 1 GB of RAM, 32 GB of internal memory, Wi-Fi, Bluetooth, GPS, NFC, an 1800 mAh Li-Po battery, and a bunch of sensors. The One X is the first handset to run Android 4.0 out of the box in India. Since it's an HTC phone, it features company's trademark Sense UI. 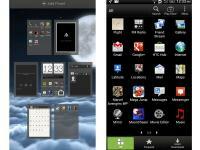 For better or worse, HTC's customization is so deep that it makes you forget that you're using Ice Cream Sandwich. 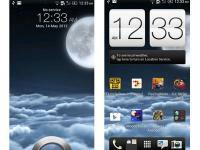 In the Sense 4.0 version, the iconic ring-based lockscreen has been improved further. The new lockscreen presets give you quick access to missed calls, SMSs, and other events. The homescreen dock now features five shortcuts. The middle one is the menu key, while the other ones are customisable. You can add up to seven homescreens, and can rearrange them in the overview mode. Overall, the Sense UI looks good; however, the user experience is hardly better than what I've seen on the dual-core phones. Additionally, despite having the oh-so-powerful quad-core CPU, the phone does lag while navigating through the UI. What's worse, is that it stutters while running the basic games such as the Teeter and RacingMoto. I think the phone runs on a single core to handle non-CPU intensive apps, and fires up all the cores only when needed. While this does seem like a good idea to optimise battery life, I bet no end-user would like to see his quad-core phone lag even a bit. HTC One X also features the latest version of the Android web browser. It comes with full-Flash support and can handle web videos effortlessly. Additionally, it offers tabbed browsing, and allows you to toggle between mobile and desktop mode. The phone has dedicated GPS, but during our tests, it failed to lock onto the satellites. However, the handset can tell your approximate location using Assisted GPS. The music player features a Cover-Flow-like interface. The phone has a Beats audio branding, but it doesn't ship with Beats audio earphones. However, the software enhancement settings are still there. You can choose between Beats audio, classical, and bass boost. Thankfully, this time around, HTC has given an option to disable the sound effects. As expected, the One X had no problems playing MP4, 3GP, AVI videos up to 1080p. Thanks to its wide viewing angles and a 4.7" screen, it's a great gadget for watching movies. The handset's camera UI gives access to the shutter button and camcorder at the same time, which means you can snap a picture while recording video. The phone offers many scene options including panorama, group portrait, and HDR. Additionally, it gives access to numerous camera filters such as Vintage, aqua, and Sepia. The delay between two shots is nominal, and image quality is good too. However, the excessive noise spoils the party. In the video mode, the One X can record 1080p videos at 30 fps. Clips are saved in MP4 format and thanks to the secondary mic, it records stereo sound. Additionally, the phone offers slow motion video mode. 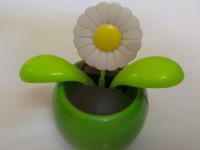 Click here to view the sample video. The handset's call quality and signal reception during the tests were good. However, as seen in the Sensation XE, this phone also has a Wi-Fi reception issue. If you grip the phone near the camera lens, its Wi-Fi signal drops significantly. The only saving grace here, is that unlike the Sensation XE, the signal isn't killed completely. The portrait keyboard is good to use, and a big 4.7" screen makes sure that you don't hit wrong keys often. Needless to say, the keyboard in the landscape mode is even better. As expected, One X's battery life isn't good. Its 1800 mAh Li-Po battery manages to keep the device up for only about 5 hours 30 minutes, and if you're playing games, it lasts only for around 3 hours and 20 minutes. The handset has a great design and is probably the most powerful smartphone that you can currently buy in India. It offers ICS out of the box, and a pixel-packed display. Having said that, it doesn't live up to the hype surrounding quad-core Android phones. In simple words, the device feels hardly any better than its dual-core counterparts.